Acast hires WNYC’s Sarah van Mosel to head up revenue efforts. It’s been a while since I’ve heard something official coming out of Acast, the Swedish podcasting company looking to move into the American market. But when news comes, it comes with force, and often with the unfortunate side-effect of leaving my inbox in flames. Here are the facts: Acast has hired Sarah van Mosel, currently WNYC’s vice president of sponsorships, to serve as the company’s chief commercial officer. She will lead up efforts to build company’s emerging U.S. business, which will likely involve some combination of figuring out revenue generators, partnerships to bolster audience growth, and strategies to increase the adoption rate of the company’s platform offering. Which is all fine and dandy, but the role may sound somewhat generic at face value, so here’s the necessary context. Acast is probably best described as an end-to-end podcasting company with three core parts of the business: a platform for hosting and content consumption, a content network, and a programmatic ad sales service. Crucial to understanding the platform are two facts: First, the platform supports dynamic ad insertion, which gives rise to the possibility of programmatic advertising in spoken audio (thus placing it directly in competition with Panoply, my day-job employer, and its current technology play, which is due to feature a similar offering); and second, the platform further emphasizes accompanying non-audio assets meant to elevate the audio consumption experience — pictures, graphics, that sort of thing — that can only be viewed if you download the app. The precise value-add there is a little counterintuitive to me, but then again, I only started really understanding Snapchat, like, last month, so give this aging millennial a break. squeeze out as much of that sweet, sweet cashola as possible. It’s a pretty big job, to say the least. Van Mosel jumped on the phone with me yesterday, and we talked about what she thinks are the primary points of opportunity. She singled out the value of dynamic ad insertion/programmatic advertising, which probably means pre-recorded spots separate from the core listening experience (and thus separate from the novel value that host-read ads brings to advertisers). She also talked about the potential for native integration and custom content. “All those things are on the table,” she said. It’s going to be enormous. I think the thing that’s going to push it along is a unification of how we count our metrics, and how we come to an agreed upon a way to make an apples to apples to apples comparison. And the public radio community is extremely close to figuring it out themselves, and when that happens it’s going to trickle out to the other sectors. Note to close podcast industry watchers: Watch the point about metric unification very closely. It’s a really big issue that’s holding the industry back a great deal, and my stomach has a distinct feeling something official and big is on the way on this front. Van Mosel’s move to Acast was most likely catalyzed and facilitated by Caitlin Thompson, the company’s U.S. director of content, who had served as an executive editor at WNYC before leaving back in July. This is yet another notable management-level departure in recent months for the New York public radio giant, with van Mosel joining the ranks of folks like Chris Bannon (former vice president of content development and production, now at Midroll) and Ellen Horne (former Radiolab executive producer, now at Audible). “[van Mosel’s move] might be a win-win for everybody,” said Margaret Hunt, WNYC’s VP of development, the nonprofit equivalent of chief revenue officer, who was also put in touch with me. Hunt mentioned that they were sad to see van Mosel go, but that they “have an opportunity now to bring in a real leader to oversee all the sponsorship revenue for both broadcast and digital.” I asked Hunt what, exactly, will they be looking for in a candidate. “Someone who’s experienced phases of high growth,” she said. “Someone who can be a real talent magnet.” They will be seeking candidates both internally and from the outside. van Mosel’s last day at WNYC is December 17. She starts her role at Acast the very next day. Another round for Gimlet. Whoaaaaaaaaaa. 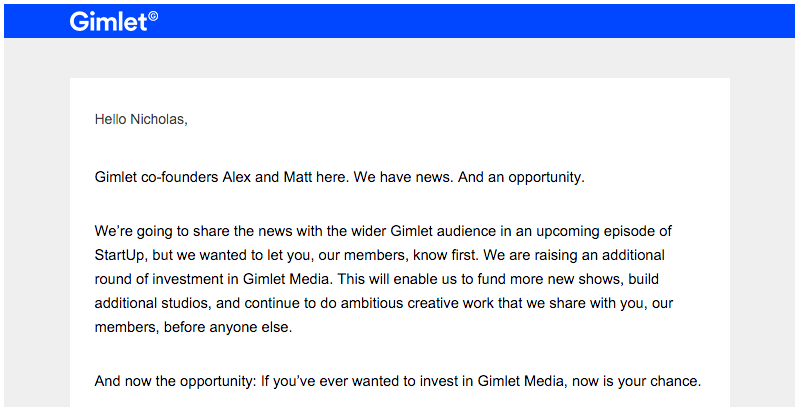 Gimlet Media, the HBO-AMC-Showtime of podcasting, sent an email out to its community last night announcing that the company will be raising an additional round of investment. This will be designated as a Series A round. Gimlet is also once again taking to Quire (formerly Alphaworks), an online investing platform, to open up investment opportunities to more people. Do note: To invest, there’s a minimum of $3,000, and you need to be an U.S. accredited investor. What’s a U.S. accredited investor, you ask? According to the Quire FAQ, the SEC defines the individual as “a person who has an individual net worth, or joint net worth with the person’s spouse, exceeding $1 million, excluding the value of their primary residence.” One can also be designated an accredited investor if her annual income exceeds $200,000 in each of the two most recent years. *looks at my dinner of reheated pizza rolls* Nope. Not me. More information about the round can be found in this week’s StartUp episode, which will drop on Thursday. Rolltape is a peculiar and highly particular thing. Essentially, it’s an app that lets you send jazzed up voice messages to another person or a small group of people. (“It’s not broadcast, it’s not one-to-one. It’s one-to-few,” said Taylor. “We might go into broadcast at some point, if that makes sense.”) Voice messages on Rolltape are capped at five minutes, but users can elevate recordings using small design additions that are conceived to modify and enhance the experience of the message — a largely decorative color to accompany the file that suggests mood and emotional context, and a musical theme that’s automatically laid down in the background of the recording that introduces and then supports the clip throughout. It’s a little hard to explain, like the mechanics of a baseball pitch or a try of cricket, and yeah, well, it’s one of those things where you can only properly understand by trying it out yourself. The app is not particularly unique in its take on audio as a social, mobile experience. Over the past few months, I’ve seen a couple of prototypes that take this bite-sized, augmented-by-other-media approach. Most have not been publicly rolled out yet. But the experience of listening to a Rolltape message as it is intended — sincerely, thoughtfully, slowly — is, to be perfectly honest, an astounding, almost transporting experience. But what does this all have to do with podcasts, or audio more generally? Like many in the podcast community, I’ve been thinking a lot about the notion of social audio; about questions of its ability to be shared or effectively transmitted, along with, of course, its potential for virality. The lead item of last week’s newsletter, “Why audio doesn’t go viral, revisited,” was a fortuitous happenstance, as the catalyzing incident — a Digg Dialog on an old inquiry into the matter — drummed up conversations that kickstarted my brain. One of the big takeaways from the Digg discussion is that the Internet is principally visual. Extrapolating this thinking further, one could say that social platforms in particular participate in this extended privileging of the visual. (That video is now the principal growth medium, and the topic of frenzy for both publishers and Facebook alike, is indicative of this fact.) So in order to make audio more shareable, one would have to make audio more acceptable by the demands of these platforms: shorter, more visual, more skimmable, and so on. One might say that these demands directly contradict what makes successful shows like Radiolab and This American Life so powerful and popular among listeners, what with their patience and conversational slack. One might also say that these digital realities are themselves opportunities for new types of audio content designed for the social landscape; there’s a reason, after all, that most Facebook video content produced by publishers borrow the same visual vocabulary, which is a vocabulary drastically different from film and television. What Rolltape represents to me is an attempt to carve out a whole new digital space that requests a completely different kind of social interaction: again, sincerely, thoughtfully, slowly. If you don’t like the way the game is played, why not make your own? Taylor interprets the current state of the social internet in…shall we say, sociological terms. Think about who created these social platforms, she said. “Text was created by white men. Twitter was created by white men. Facebook was created by white men. There is no coincidence that men created more of these transactional form of communications,” she continues. And this has shaped media consumption behaviors. “In the industry, everyone assumes that everyone wants quicker, shorter, faster.” Rolltape, then, is an expression of the other side of a dialectic. I’m not sure what I think about that, but I can’t help feeling like I’m slightly convinced. (I’m also partially a Beyoncé baby truther, so I’m not the best reader of reality.) And I’m not sure whether Rolltape will ultimately be a thing — it is, in my opinion, still very early days for that company. But I’m drawn to Taylor’s ultimate premise: the notion of resisting the pull of social, the notion of leaning deeper into the demand of audio to just take it slow. Now it’s just a matter of seeing whether I can make a living off this kind of thinking. Don’t know if this counts as an an official press release, but despite my apartment burning down The Sarah Awards is now accepting submissions! I didn’t even miss the deadline. Here’s the information. F*CK YEAH! Glynn Washington agreed to host. I’ll have more details for you later but it’s going to be an epic, weird and amazing award ceremony on April 1. We also announced our winner for the first Very, Very, Short, Short Story Contest, Ellie Gorden Moershel. Some fine numbers from Radiotopia’s latest crowdfunding campaign. I’m late to this (yikes! ), but November 19 saw the conclusion of PRX’s second major fundraiser for Radiotopia, its beloved podcast network/indie label/hippie commune. This year’s campaign saw over 19,612 contributors on the CommitChange platform, which is a little less than the 21,808 backers that contributed to last year’s record-breaking Kickstarter campaign. It’s hard to do an apples-to-apples comparison, given that CommitChange emphasizes recurring donations while Kickstarter is structured more for dense one-time donation campaign runs. But observers may be intrigued to learn from a PRX blog post that 82 percent of contributors signed on as recurring donors. Yowza. The co-opting of the public radio pledge drive model lives on! You should check out the blog post in full, as it contains an assortment of lessons that the PRX team learned over the course of this year’s campaign. If sponsored content is now considered old news in the world of text-based online media, it’s still a fairly new prospect when it comes to big brands funding podcasts. But it’s likely that this model will come to coexist alongside other podcast business models, like host-read advertisements, programmatic advertising, and reader donations or paywalls.